My sweet friend and fellow dirty girl Jodi (kharmagirl) is hosting today's color challenge on SCS. Yay, Jodi! :) She picked Really Rust, Chocolate Chip, and Baja Breeze. Great fall colors! Both Really Rust panels are up on separate layers of dimensionals. The grosgrain ribbons and rust brads are from Pink Hedgehog Paper Crafts. 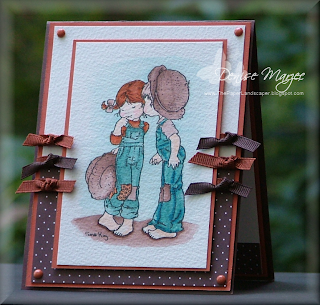 The image was stamped in Versafine Black Onyx onto Fabriano watercolor paper and watercolored with Baja Breeze, Really Rust, Basic Brown, Pacific Point (just on the seams of the boy's overalls), Blush Blossom, and Pink Pirouette (just on their cheeks...gotta make 'em blush, hehe!) reinkers with a wet watercolor brush. I chose to CASE her Always card. I love all the white space, the cuttlebugged dots along the bottom, and the Bella Rosa DP that she used. I used a different stamp, this Inkadinkadoo Rose stamp that I just bought at AC Moore...love this image! I also used different ribbon and added some pearls. I stamped the image once onto the white base and colored it. Then I stamped a second image, watercolored the rose, leaves and one of the small flowers, cut it out, and popped it up on dimensionals over the base. My blogging friend Shannon (e3stamper) was last week's featured stamper on SCS.....I had that nasty cold last week, which really threw me off with challenges, but I wanted to play along and CASE one of her cool layouts as soon as I could. How fun! Big CONGRATS again, Shannon!! I'm so excited that you were picked as a FS and I'm sorry it took me so long to CASE you. Here's Shannon's card that I chose to CASE. I kept the same basic layout, polka dots at the bottom, piercing, and animal theme. I just changed the colors, used my brand new Whipper Snapper Crazy For Chickens set from Anna Wight, added a second row of ribbon, and added some layers. The circles are up on dimensionals, and so is the black mat square behind them. 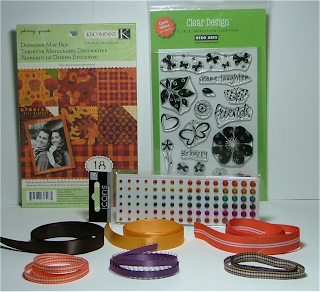 Accessories: Black and Orange Gingham Ribbon, Nestabilities Double Ended Tag, Nestabilities Circle Die, Orange Brads, Paper Piercing Tool and Mat Pack, Dimensionals. I don't (read: can't) sew, so I faux stitched my card using my piercing tool and SU mat pack. I used Taylor's cupcake sketch from yesterday (TECC35), faux stitched all four background squares, the main image square, and the panel on the inside of the card with a Close to Cocoa marker. 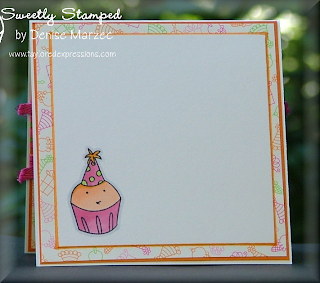 The cupcake stamp and sentiment are from Taylored Expressions, Stamp a Sweet Impression Collection. The wide polka dot ribbon is from Strano Designs. The image was stamped a few times onto plain white CS and Bella Rosa DP. 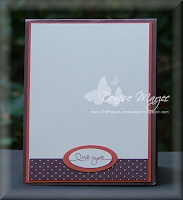 The cake slice was watercolored with Close to Cocoa and Basic Brown classic ink. The paper under the slice of cake was cut out and paper pieced, glued down with tombo adhesive flat to the base layer. The top of the cupcake was watercolored, cut out, and popped up on dimensionals. The bottom of the cupcake was cut out from the Bella Rosa DP and popped up on dimensionals. The main image, four background squares, and punched sentiment are all up on separate layers of dimensionals. A pink swarovski crystal was added to the top of the cupcake (glued down with a small dot of Crystal Effects), and orange stickles were added to the candle flame. The shadow under the image was done with C1 and C5 Cool Gray Copic markers. I just received all the swapped out cards from the Great Swaps Girls, so I think it's okay to post this now. This is the card front I made using the new Snow Swirled set and "I Wish" Scrappin' Kit. 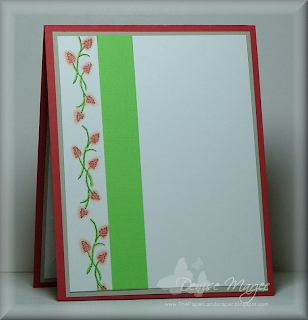 The olive boho flower, 1-3/8" red circle, and photo corner punch are all up on dimensionals. Everything is SU only. How 'bout those shirts? ?...do we look like walking billboards for Penzoil and DuPont or what?? LOL! Unfortunately, I got hit with what I thought were allergies over the weekend while we were there...some sniffling, sneezing, etc. When we got home yesterday though, it turned to chills and a fever....so I guess I'm dealing with my first cold of the season. Ick! My daughter's bestest little friend turns 4 in October, so this card is for her. 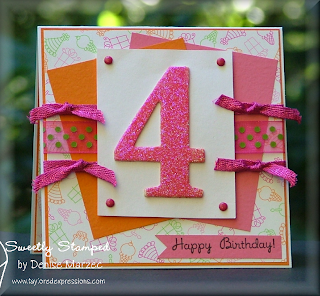 The big number 4 started out as a plain pink chipboard piece with adhesive backing. I covered it with Versamark, sprinkled on some heat and stick powder, heated it with my heat gun, then sprinkled on some of Taylor's Raspberry Soda glitter (yummmmmy stuff!! ), and heated it again to seal the glitter. The white panel with the number 4 is up on dimensionals. The "flag" end of the sentiment was done by sticking the sentiment into a tag punch at an angle. You could also use the corner of a square punch....I just don't own the square punch. Except for the chipboard number 4 and the PTI White CS, all elements on my card are from Taylor's Birthday Girl Key Ingredients pack. Love these packs that she's put together!! So pretty and so much fun!! The inside of the card has an Intense Orange panel, a panel of the same DP that's on the front of the card, and then a white panel with one of the cupcakes stamped in the lower left corner. After I had it all glued together and onto the card, I realized I should have matted the stamped white panel with Orange. It was too late to do that...so instead, I took my YR15 Yellow Orange Copic and outlined the white panel. I'll be at the Dover race tomorrow. Look for me on TV...hahaha! Monday's Technique Challenge on SCS was to make a card using the Glitter Surprise technique. Fun technique. I posted it to SCS on Monday, but wanted to share it here too. 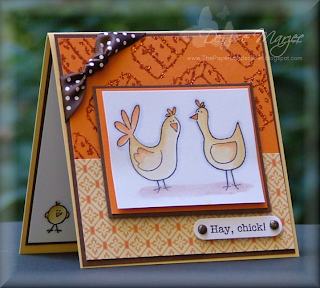 I used the new Crazy for Chickens set from Whipper Snapper Designs that was released on Monday, designed by Anna Wight! The bales of hay were stamped in Versamark on the Pumpkin CS, coated with heat 'n stick powder, heated, coated with Pumpkin glitter from Art Institute Glitter, and heated again to set the glitter. 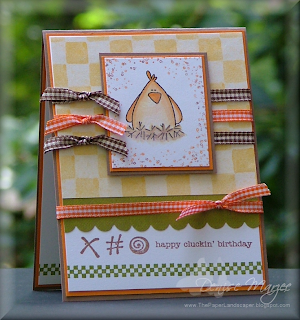 The white panel with the chickens, the chocolate mat behind the chickens, and the punched sentiment are all up on separate layers of dimensionals. The inside of the card has a chocolate chip panel with a white panel over top of that. One of the small chicks from Anna's set was stamped in both the lower left and lower right corners, watercolored with saffron and pumpkin ink, and outlined with the blue gray copic. Here's a card for today's SCS Sketch #194...I just turned the sketch on it's side. When I saw Dawn's post this morning with the ATS Color Challenge, I knew I wanted to use this color combo (riding hood red, baja breeze, and kraft). I think the combo is really pretty and I thought it would tie in realy nicely with my cupcake stamps from Taylored Expressions. The cupcakes were stamped in Versafine Black Onyx and then watercolored with Creamy Caramel, Riding Hood Red, and Baja Breeze reinkers. Gwen asked me yesterday what tools I use to watercolor. I use a regular wet watercolor brush...the regular bristle type. The main panel was stamped, watercolored, and then matted against the Kraft CS. Then I punched a couple holes with my Cropodile, ran the taffeta ribbon through them, added some sparkly white brads over the holes, and glued that panel down with dimensionals. The scallops were done with Stampin' Up's scallop edge punch. 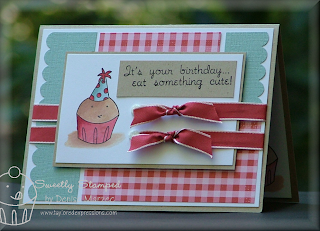 Here's a card for today's color challenge on SCS (always artichoke, riding hood red or real red, and basic gray). The stamps are from another one of the NEW cling mount sets by Anna Wight at Whipper Snapper Designs. This one is called Give Thanks. 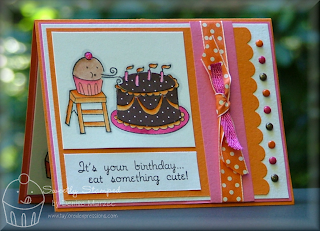 Anna posted a card on her blog today too using this cute set. Be sure to stop by and check it out! All images were stamped in Versafine Black Onyx, and then watercolored with Always Artichoke and Riding Hood Red. The inside of the card has more apples stamped in the lower left and right corners. Whipper Snapper Release and Stamper's Dream! Hi everyone! Okay, this is going to be a long post, but I have LOTS of exciting news to share today!! First, today is the release day for three new Anna Wight cling mount sets at Whipper Snapper Designs. If you know me at all, you know I LOOOOVE Whipper Snapper and Anna's illustrations. Sooooo, you can imagine how incredibly excited I was to be asked by Anna (THE Anna herself!) and the owners of Whipper Snapper, John and Lisa, to join the design team for September and October! OMG, YAYYYYY! Thank you Anna, John, and Lisa!!! I feel so lucky to be working with all of you and the incredibly talented DT for the next couple months! So here's my card using Anna's new Crazy for Chickens set. I love this set. Not only are the chickens adorable, but check out that funny sentiment. What a crack up! Love it! I just had to use it on the first card I made, LOL! The main image was watercolored with SU classic ink. All of the stamps used on this card are in Anna's set, even the "grain" around the main image. The Close to Cocoa panel that the chicken is matted on is up on dimensionals. 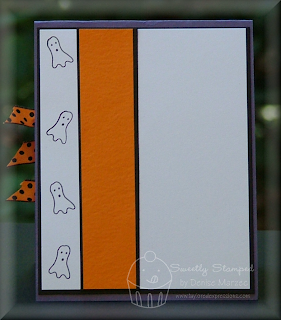 The inside of the card has a Pumpkin panel, a White panel, and then I stamped the same green checker pattern along the bottom. ...The new SCS Fan Club gallery opened TODAY! Soooo, if you're a fan club member on SCS, be sure to stop by to see what everyone has made this month and to see the newest dirty girls...drumroll...Mary Jo Albright and Jennifer Buck! Welcome to the dirt pile, girls!!! You both so deserve to be in the dirt pile and I can't wait to get to know you better. Enjoy the ride, it goes fast. ...now for some MORE exciting news! Just this weekend, I got an email from Michelle at Stamper's Dream asking me to be a part of her incredibly talented DT starting in November! ...oh my word, seriously, can you feel how much my head is spinning right now?! She not only has such a great variety of stamps and supplies in her store, but she's super nice and has SUCH an incredibly talented team. Thank you, Michelle, for the opportunity and to everyone on the DT who gave me such a warm welcome yesterday! I think you're all awesome! That's it for today. Be sure to stop back throughout the week, as I'll have more cards using Anna's new cling mount sets! Hi everyone! It rained again alllll day yesterday and I think we're in for more allll day today. Ick! 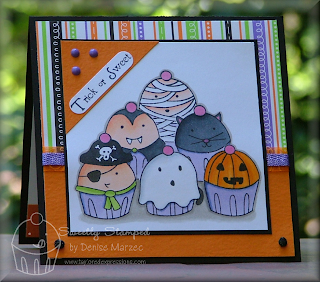 Anyhoooo, here's my card for today's OCC challenge...it's a sketch...hosted by Amy Sheffer! Be sure to check out the OCC blog to view the sketch as well as the great samples from the girls. I inked up my new Butterfly Happiness set from There She Goes. 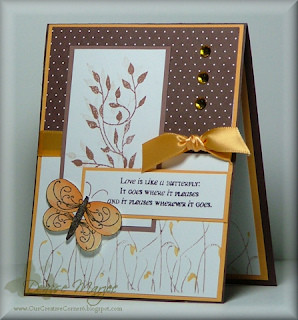 The butterfly was stamped in Timber Brown StazOn, watercolored with Marigold Morning ink, cut out, and popped up on dimensionals. The stems along the bottom were stamped in Close to Cocoa and Marigold Morning ink (colored direct to the acrylic stamp and then stamped onto the white CS). The main panel was stamped in Close to Cocoa as well, twice...once for the darker image and then again for the faded one. The inside of the card has a Marigold Morning panel, and then a white panel over that stamped with the same Marigold and Close to Cocoa stems that are on the front. 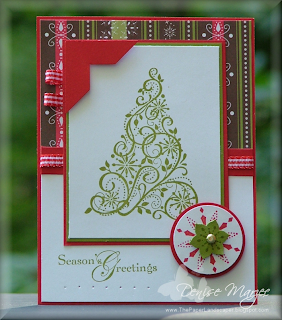 My card is for today's Sketch Challenge (SC193) on SCS. Fun sketch! Pretty straight-forward and quick card for today. 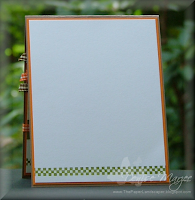 The stamps, cobalt and orange Prism paper, yummy ribbon, and brads are all from Taylored Expressions. 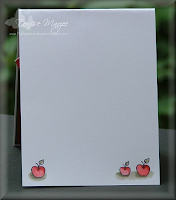 Wanna see a REALLY cool project?...check out what Charmaine made and posted today on the Stamp a Sweet Impression Blog. Totally cool, Charmaine, LOVE it!! The main panel is up on dimensionals. The inside of the card follows the same layout with the vertical black/orange strip. I just added some ghosts stamped along the left edge. Hi everyone! It's raining like crazy here in PA today....reason for the indoor pic with the OTT light. Yes, I actually have one of those. I just prefer to take my pics outside...well, when the weather is cooperating that is, LOL! Thank you all for your comments, kind words, and suggestions for my blog. Sounds like a lot of you like the detailed recipes, regular posts, outdoor photos, and you like that I decorate the inside of my cards. As far as suggestions, it sounds like a few of you would like to see me update my banner and maybe add some tutorials. Any suggestions as to what kind of tutorials?? Oh, and Alberta suggested that I color a stamped image (like a garden) and use that for a banner. Any suggestions on a cool garden stamp?? Quick note to Marilyn...I don't own ANY fun flock. I know, GASP!, right? Who doesn't own fun flock?? Well, me, LOL! Quick note to Linda...video tutorials??...Oye! I'd have to give that a LOT of thought because I think I'd be too nervous to do it, LOL! Okay, so onto today's card for Emily's color challenge (going gray, riding hood red, and green galore). It's a regular 5.5" x 4.25" card. I ran the left edge of the white panel through the Cuttlebug with my new Just My Type embossing folder. I thought the embossed flowers sorta matched the flowers in the main image. I got the gorgeous Long Time Friend images from my friends Lori (LMcAree) and Janette (blessingsx3). Thanks girls!! The images were colored with Prisma pencils and then blended with Gamsol. The Red Scallop Rectangle behind the main image is up on dimensionals. The dew drops are from my friend Silke (sparklegirl) and they're glued down with a small drop of Crystal Effects. Thanks Silke!! Inside of the Card: Going Gray panel, white panel with the Long Time Friend flowers along the left edge, and then a thin strip of Green Galore to the right of the flowers. That's it for today. Gotta get ready to take the dog to the grooming shop...he's NEEDS a bath so bad!! Don't forget to stop back tomorrow to see who won the blog candy. Hi everyone! Hope you're having a great weekend so far! Here's the blog candy I promised. This past week, you all have pushed that little counter past 40,000+ hits. Thank you all SOOOO much!! All you have to do to enter to win is comment on this post and tell me what YOU think of my blog....what do you like best (or least), is there something you'd like to see me do differently or something you'd like added, do you have any fun suggestions, etc., etc. I'd really like to hear what you want to see! Oh, and when you're posting your comment, if you could leave the post number too, that'd be great. I'll pick a winner on Wednesday, September 10th around noon Eastern time. OCC Challenge - make her laugh! Hi everyone! Amy Sheffer is our hostess this month on the OCC! 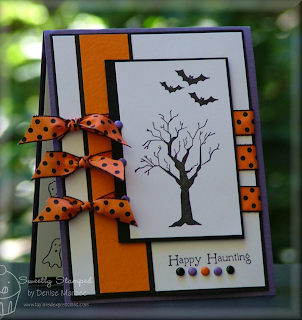 This week, she's challenging everyone to make a humorous card. 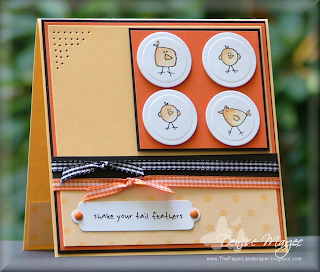 It can be a funny sentiment, a cute image, or an out-of-the-box way of using a stamped image. Help keep Amy laughing instead of crying, as she turns 40 this month! Happy Birthday, Amy! 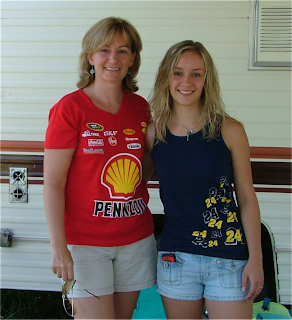 Also, please join us in welcoming Julee Tilman as a permanent member of the OCC blog team!! Glad to have you with us, Julee! My card uses another new set from Taylored Expressions. This one is called Sweet Celebration. All of the textured Prism CS (pink, orange and white), orange and pink ribbon, orange and pink brads, and the raspberry soda glitter used on the cherry can be purchased at Taylor's store! I thought these images would fit into the "cute" category...and it even says to "eat something cute" in the sentiment. 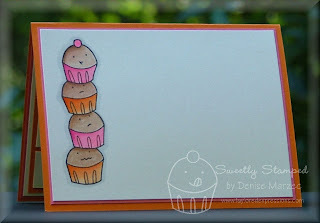 If you look at the picture (below) of the inside of the card, I think that little cupcake at the bottom with the squiggly mouth is pretty funny too...that poor little guy who has to hold up the whole bunch, LOL! The card measures 4.25" x 5.5". The cupcakes were watercolored SU classic ink. An extra birthday cake was stamped in versafine black onyx onto the brown/white polka dot print from SU's Bella Rosa DP, cut out, and paper pieced over the base. The outline around the images was done with a C-1 Cool Gray Copic marker. Hi all! It's Release Day at Taylored Expressions and you can NOW as of midnight purchase the new stamps and key ingredients you've seen over the past couple days! This time I made a card with the Trick or Sweet set. Each one of these trick-or-treater cupcakes are individual stamps. I stamped them once onto post-it notes and cut them out. Then one at a time I stamped them again onto white CS, using the cut-out post-it notes as "masks." I started with the front row of characters, then stamped the vampire and cat in the second row, and then stamped the mummy in the back. My card measures 5.25" x 5.25" square. I colored the image with Copic markers (the numbers are noted below in the recipe). I added some Crystal Effects to the brads in the lower corners of the card and sprinkled on some of Taylor's Black Ice glitter. The Doodlebug patterned paper, textured Prism cardstock, purple brads, black brads, ribbons, and glitter are all available for purchase at the Taylored Expressions store. I'm including a picture of the inside of the card as well. I glued down a white panel, a strip of Intense Orange Prism paper along the bottom, a strip of the Doodlebug DP along the top, and then stamped the sentiment on the white CS. Drop off went fairly smooth...just about a minute of clinging to my leg. 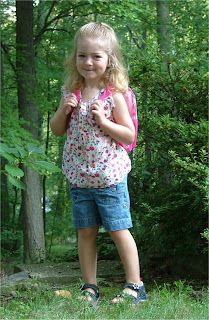 When I picked her up we got a great report from her teachers. They said she listened, played well, and was very "social"....Yay! I'm so proud of her! She's such a big girl now! *Please* keep your fingers crossed. On Tuesday, we went in to meet with the teachers, go over ALL the stuff (oh my word, there's sooo much more for parents to do with preschoolers than there used to be...like when my oldest was in preschool) in the handbook, and give her a chance to see her classroom as well as meet a couple of her classmates. Well, it did NOT go well at all. She wouldn't play with anything, wouldn't talk to anyone, and wouldn't let them take her picture for her storytime mat. She had her face buried in my arm or back the whole time. So, needless to say, I'm so nervous now. Ohhhhhh, I hope she does okay! Oye! Tomorrow is Taylor's Release Day. 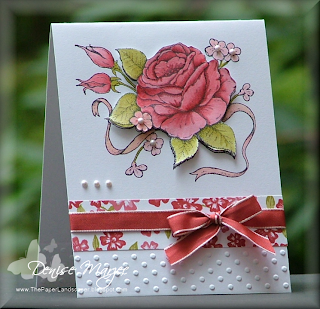 I'll have a card to show you, and I'll also have something for Saturday's OCC challenge using Taylor's stamps. Be sure to check Taylor's blog later this morning though. She's announcing the rest of the Baker's Dozen and she'll share more info about her stamp sets! Hi everyone! I have some really exciting news to share today! Taylor Van Bruggen asked me to be one of her new DT members!! She has a new stamp collection called Stamp a Sweet Impression....such CUTE stamps! Thank you, Taylor, for this amazing opportunity. I really can't even put into words how excited I am to work with you and all the DT girls. I hope I make you proud. A little about the stamps. They're unmounted rubber, already die cut and deeply etched. They truly stamp beautifully. You're going to love them! Taylor even has coordinating papers, ribbon, brads, and glitter for sale to go with the stamp sets. How cool is that? !...one-stop shopping! 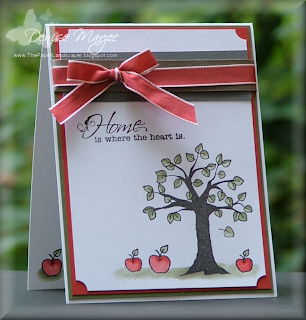 You can see more details about the stamps and key ingredients on HER BLOG and HER STORE. Release Day is this Friday, September 5th, and you can start purchasing everything starting at midnight Eastern time. In the meantime, there will be lots of sneak peeks this week from Taylor and the design team. If you'd like to do a little blog hopping, here are links to sneak peeks from Jami Sibley, Charmaine Ikach, Monika Davis, Stephanie Hargis, and Ana Wohlfahrt. Taylor will announce the rest of the DT on her blog tomorrow! I'm calling mine a "Ghoulish Greeting." The set includes a door hanger, an acetate treat box (mine is filled with Reese's candies), and the poem rolled up into a scroll. If you click on the picture of the scroll, it'll enlarge it so you can read it better. I set up the outline of the poem on Microsoft Word and left space where I could use some of Taylor's stamps, printed it out onto plain white printer paper, and then stamped the sentiments in Black ink. 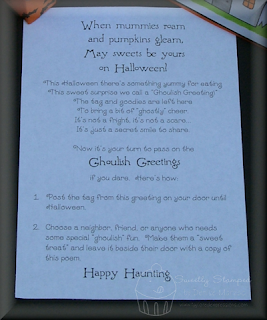 You could, of course, type up the whole poem in Word...I chose to do it this way with the actual stamps so the poem would have the same fonts as those on the treat box and door hanger....again, matchy-matchy. LOL! I followed Debbie Van Gieson's tutorial for the acetate treat box, EXCEPT I started with a 5.5" x 8.5" sheet of acetate because I wanted a shorter treat box. The ribbon, Prism paper, and brads are all available for purchase through Taylor's store! The overall measurements of the door hanger are 4" wide x 6.5" high. Again, the ribbon, Prism paper, and brads are all available for purchase through Taylored Expressions. Before gluing any of the panels together, I punched two horizontal slots into the white stamped layer and ran my ribbon through them. That way the edges of the ribbon are hidden between the white layer and the Basic Black layer. The same thing was done with the brads. The backings are in between the white and black layers of CS. That's it for today. I'll have some more sneak peeks for you on Friday and Saturday!